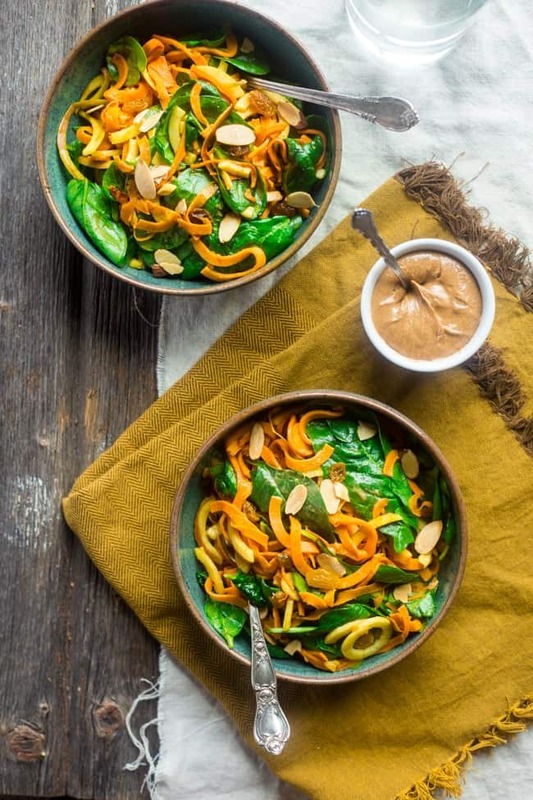 This vegan and whole 30 compliant spinach salad features sweet potato noodles, apples and a creamy almond Dijon vinaigrette for a healthy, weeknight meal! Hoooolddd up. Awkward nutrition-packed salad recipe being posted on a FRIDAY, COMIN’ THRUUUU. 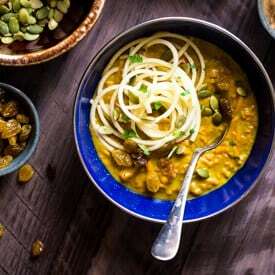 This bowl full of glowy-healthy-food-goodness is a combo of tender sautéed sweet potato noodles mixed with crispy-fresh apple noodles, chewy & sweet golden raisins with a little hint of crunch from some roasty-toasty almonds. And the dressing. Really guys. This WHOLE salad situation is about this dressing. This nutty, sweet and bright vinaigrette where almond butter, apple juice and DIJON MUSTARD come together in the thickest, creamiest and most YUM kind of ways. And it tastes, liiiiike, really good as it coats each swirly sweet potato noodles and enters the land of no return. For those of you who read that last paragraph of pure healthy-veggie salad bliss and ONLY got out “almond butter with DIJON MUSTARD?!!! !” I can understand you. You are my peeps, so I knew this notion could wander across your brains before you let it enter your salad munchin’ mouths. Do you know those times when you mix stuff in your fridge together and then kind of cross your fingers, and PROBABLY your toes too, before you take a little taste? You know when you’ve got the water within grabbin’ distance because you’re basically about 99.99% positive that the random ingredients you dumped into a bowl and did a little stirring action, have NO place being together whatsoever? This was one of those times. But, for some reason, the mustard and almond butter combo was SPEAKING TO ME. Oh HELLO THERE new salad dressing obsession. It’s like this taste-bud tingling blend of sweet nuttiness with that surprise tang of the Dijon mustard. If we’re just being realsies here for 2 seconds, I’m going to call it the vinaigrette from Heaven. I wouldn’t even be upset if you nix the rest of the salad and just put this vinaigrette on every other food item that resembles a leafy green for the rest of the leafy-green meals that enter your mouth space for your life. I’m lying though. Not about all the leafy greens forever. Just about not making THIS salad. The situation here is looking pretty tasty. If I were you I would be suffering from FOMO if I made a DIFFERENT SALAD. You know. ALSO. This salad concludes Whole 30 dinner week. Did you try the Mango Chicken with Coconut Cauliflower Rice or the Jerk Shrimp Stew? If not, do you live UNDER A ROCK? You know who else might live under a rock? Or at least near a rock? Bunnies like salads. Which means your rock-dwelling self will like THISTHISTHIS salad. Right here. Right now. Healthy Friday. You might even like it. Lots. Preheat your oven to 350 degrees and place the almonds onto a small pan. Cook until lightly golden brown and toasted, about 7-10 mins. Watch them closely as they can burn quickly. While the almonds cook, heat up the olive oil in a large pan on medium heat. 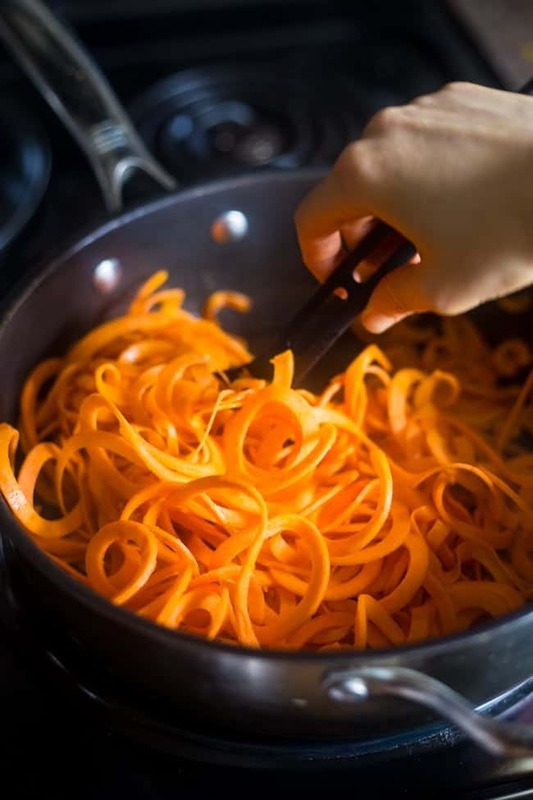 Add the sweet potato noodles and cook, stirring frequently, until tender and wilted, about 7-10 mins. Season with sea salt. 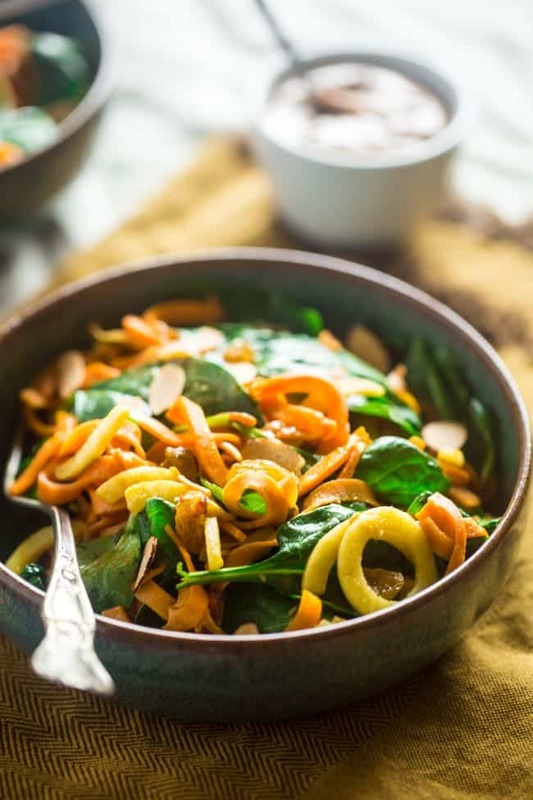 Place the cooked sweet potato noodles into a bowl with the spiralized apple, spinach, golden raisins and add in the toasted almonds. Mix well. 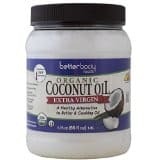 Add the apple juice, almond butter and apple cider vinegar into a small, microwave-safe bowl and microwave for 30 seconds to soften to almond butter. Add in the Dijon mustard and ginger. Whisk until smooth and well combined. While whisking, add in the olive oil and whisk until smooth and creamy. Add a pinch of salt. Divide between two plates and DEVOUR! 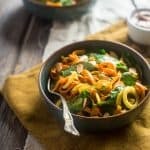 Want more vegan sweet potato noodles? I would never think almond butter and Dijon together would be good. I definitely must try this. It could be a salad game changer! I was obviously apprehensive too, so I totallllly understand! Let me know if you try it girlfriend! Thanks! My goodness Girl, just when I think you’ve already noodled everything you come up with some new way to spiralize something else that I love! This looks amazing, Taylor! Thanks Tori – happy weekend! You are the bestest! Thanks! 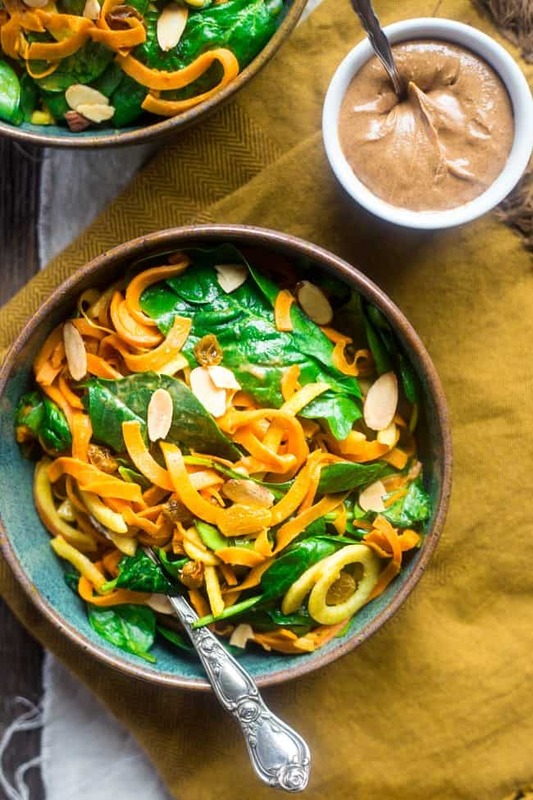 Delicious and fun salad to eat with all of the spirals and delicious drizzle of almond dijon vinaigrette is a super way to start out the new year. I really need to invest in a spiralizer as I know I would use it all the time. 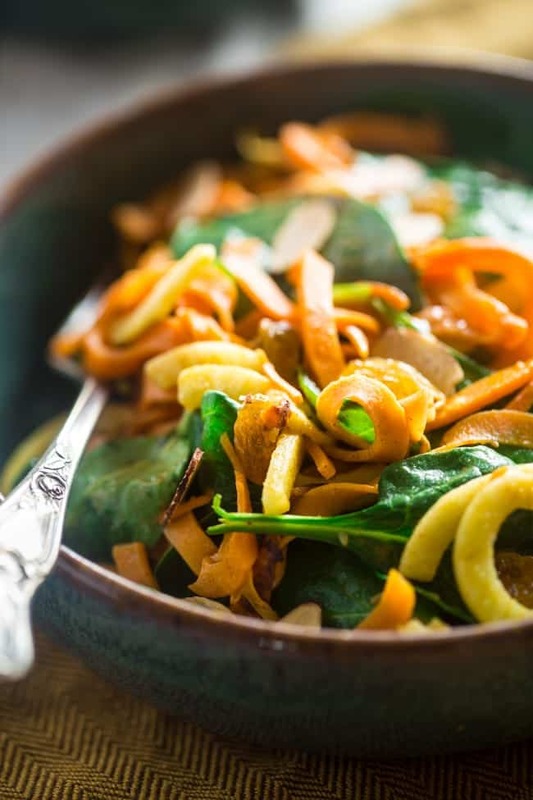 Thanks so much for including our Autumn Festive Salad in your spinach salad round up. Wishing you a super weekend. It’s all about making salad fun right?! 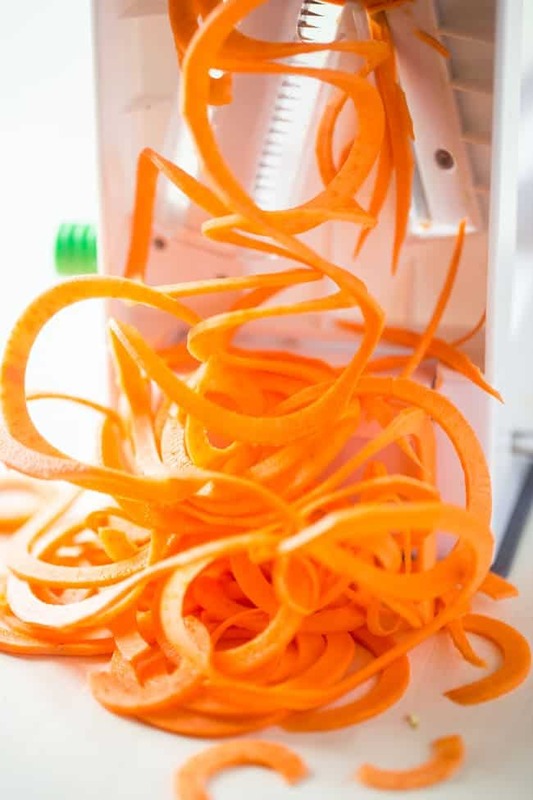 You TOTALLY need to get a spiralizer, I promise you’l use it! And you’re welcome, happy weekend to you and thanks for the salad love! I am SO glad you think so! Thanks Kristen! This sounds so incredibly satisfying! I love those sweet potato noodles! Those sweet potato noodles!!!! love this, Taylor!!! Whoa, that dressing sounds amazing! I’m perfectly happy with a salad recipe on a Friday as long as it’s full of crunchy and flavor like this one! I’m glad you ain’t hatin’ on the saladness of Friday! Thank you Danae, that dressing is everything! Great salad! I love how easy and flavorful it is. Seriously….this recipe looks delicious and I love how simple it is! Beautiful too! Thank you so much Stacie! Sometimes simple is the best! This sounds delish!! I have been wanting to try sweet potato noodles…! Thanks for the inspiration! WHAT?! YOU HAVEN’T TRIED THEM?! You must girlfriend! Thanks and happy weekend! Nothing at all wrong with posting an akward nutrition packed recipe on a Friday! The perfect way to start the weekend 🙂 🙂 🙂 It looks so good!! I’m glad you don’t hate the saladness! 😉 Thanks beautiful! Let’s face it. Healthy food just looks better than some canned soup casserole. 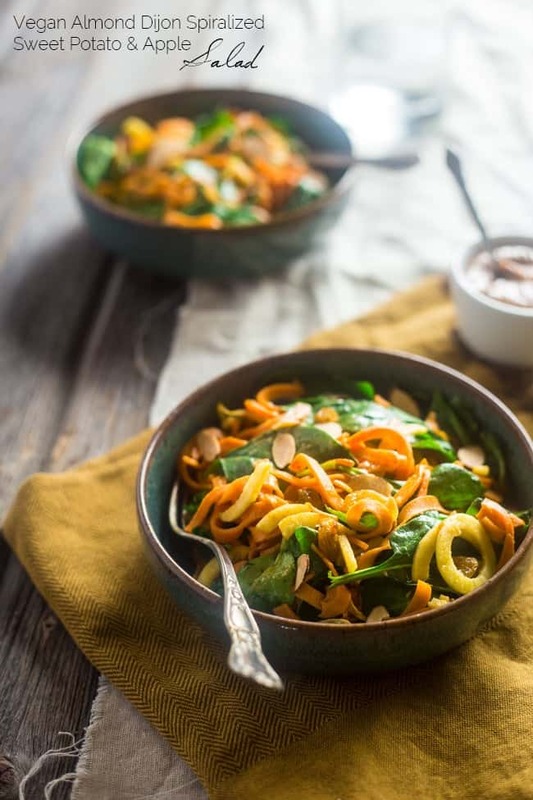 I’m on a salad kick too, so I’m with ya.And, the idea for sweet potato noodles. WOW. Pinning. YES I so agree, it’s just so BEAUTIFUL! 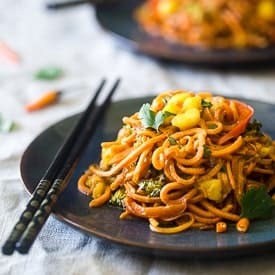 You totally need to try sweet potato noodles, the BEST! Thanks for the pin! Sounds fabulous! 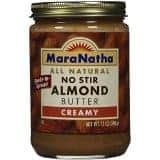 I eat almond butter almost daily after ditching peanut butter about 5 years ago. Can’t wait to try it! Thanks for the inspiration, Taylor! Almond butter is my new love over peanut butter too! Never thought I’d say that! Thanks Tania! I KNOW! You SO do need to get one! It makes veggies SO much more fun to eat! Thanks Cailee! Oh, Taylor – this looks so wonderful! 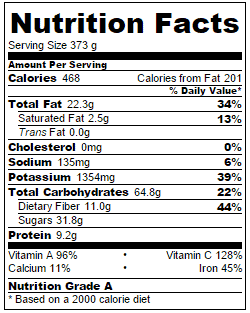 Beautiful and just loaded with great nutrition! I’ve gotta admit, as amazing as the entire dish sounds, it was that creamy almond Dijon vinaigrette that truly reeled me in. Dying to try that part, especially! What a fantastic meal! Thanks so much Shelley, it’s all about the vinaigrette! Do you know what it means when someone throws almonds in a food processor, letting it whir and whir until almond butter forms because said someone doesn’t have almond butter in the house? It means that someone (me) really wanted to eat this for dinner last night! Sadly, I don’t own a spiralizer, but grated the sweet potato on the large holes of a box grater, and still got a sort of noodle-y effect. I cut the apple into matchsticks, and substituted spicy brown mustard for the Dijon. Delicious! BAHAHA oh my goodness, this comment just made my whole life! I can totally see myself doing that. COMMITMENT! I am SO glad you loved it, even with your changes!! Thanks for letting me know! Hey Taylor!!! 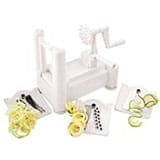 Just wanted to let you know that “Spiralizer” pic/link you posted under tools takes us straight to an Amazon page showing NOT the Inspiralizer but an impostor!! Abhorrent I know. 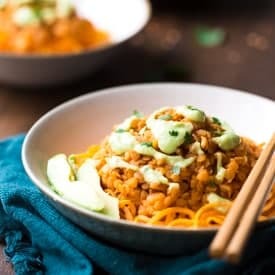 I’m just glad I bookmarked the Inspiralizer website that your post originally took me to so I can get what you use to make those abso-mazing looking noodles!!! Anywho, I just wanted to let you know of the change in case it happened without your permission. Haha thank you! Unforunately, the Inspiralizer isn’t on Amazon, so I’ve linked the to spiralizer I used BEFORE I had the inspiralizer…it’s still *almost* as good! but thank you so much!! The flavor combination is perfect!!! I hate sweet potatoes, but this recipe makes them yummy! This looks to die for. Would it totally change the flavor of the dressing if the ginger was omitted? I’m not a fan of it and it’s only half a teaspoon. If the dressing can’t live without it, I’ll give it a go! I can’t tell you for sure as I have never tested without it! I am sure it would still be good…but it does add some of the flavor! This was seriously one of the best salads that I’ve ever eaten! My husband who does not care for salads at all said he’d eat it any night of the week! I omitted the raisins since we don’t need the extra sugar and it was just amazing! Thank you so much for this wonderful, healthy recipe! I am SO excited to hear this! AND that your hubby liked it – mine is so not a salad guy either, so I know that’s a big deal! Thank you for sharing! I didn’t follow the dressing to the “T” because I didn’t feel like buying apple juice just for this recipe, but the salad was great! Quick and tasty meal that paired well with the leftover pumpkin no bean chili. Will add this to my repertoire for meatless Monday or a quick salad night. Woo hoo! So happy to hear this! Thanks for letting me know! !